The PHD Movie Soundtrack was primarily recorded at the California Institute of Technology (Caltech). Many of the musicians featured are real researchers and scientists. 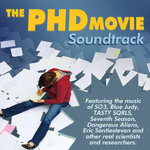 The PHD Movie (www.phdcomics.com/movie) introduces audiences to the unique and funny culture of Academia and follows four graduate students (Cecilia, Mike, Tajel and the “Nameless Grad Student”) as they struggle to find balance between research, teaching and their personal lives with humor and heart. SO3, TASTY SQRLS, Dangerous Aliens, Blue Judy, The Seventh Season, Eric Santiestevan and Scott Elmegreen. Additional musicians: Paul Anzel, Jonathan Choi, Kevin Engel, Cendri Hutcherson, Ajay Limaye, Erik Liu, Tom Ruchti, Kunio Sayanagi, Jonathan Schor, Timothy Wu and Jeremy Yager. "Piled Higher and Deeper" The Movie is a live-action adaptation of the popular online comic strip by Jorge Cham. It was filmed on location at and was produced with the support of the California Institute of Technology (Caltech). Yeah I know, you're all alone. Sometimes we all get carried away. but you've always been a friend.